A child custody dispute between two parents from the San Diego area can be tough enough to sort through, considering the intense feelings that each party brings to the conflict. In the best of cases, each party wants what is best for the child and will work together to achieve that goal. But as we see every day, parents do not always agree on what that is. Consider now that one of the parents lives in another state or foreign country, and the related issues that can arise when attempting to settle child custody and visitation arrangements. If you are facing any sort of child custody matter, it is very important to reach out to a local family law attorney who can help you to achieve the most beneficial arrangement under the circumstances. Things can get tricky very quickly when one of the parents lives out of the country. Issues concerning how often the child can see that parent (logistically as well as practically – in terms of time off from school and the sheer costs associated with traveling), as well as the ability to share in the significant decisions affecting the child’s welfare, are just some of the layers of problems confronting parents in this situation. According to a recent news report, an American mother and her six-year-old daughter are now “stuck” in Brazil as a result of a contentious custody battle. The mother and child traveled to Brazil in late May with the asserted intention of connecting the girl with her father who she had not seen in over three years. The mom has had full custody of the daughter since the couple split up in 2009. When the two arrived in Rio De Janeiro, the daughter said that she received a message from a mutual friend indicating that her father planned to keep her once they met up with him. At that point, mother and child changed their plans and flew to another location in Brazil and failed to meet up with the father. The father filed court papers requesting that their passports be confiscated because they skipped their scheduled meeting. The court granted his request. The news article suggested that it is common for Brazilian officials to confiscate the passports of parents if the judge believes there is a possibility that one of the parents may attempt to take a child out of the country against the other’s wishes. However, it has been reported that, just recently, a Brazilian judge decided to return their U.S. passports and the two traveled safely back home. According to a website maintained by the California Court System, if you believe that your child is at risk of being abducted by the other parent, it is very important that you have a clear custody order that specifies what the other parent can and cannot do in terms of traveling with your child. But keep in mind that even if you have a court order, U.S. laws and court orders are not typically recognized in foreign countries and may not be directly enforceable abroad. Child custody matters are complicated and must be attended to with the utmost care. An experienced family law attorney can help to protect you and your family’s rights. If you are a parent with questions about child custody matters, you are encouraged to contact Doppelt and Forney, APLC . Mr. Doppelt is an experienced and dedicated family law attorney, representing parents for more than 20 years in Southern California. Doppelt and Forney, APLC serves clients in San Diego, Linda Vista, Encinitas, Scripps Ranch, and throughout Southern California. 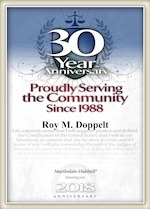 For a free consultation with a devoted and experienced family lawyer, contact Doppelt and Forney, APLC through the law firm’s website or give us a call toll-free at (800) ROY IS IT (769-4748).